Ah, summer—you saucy minx! In so many ways, you are our favorite season—nothing feels better than basking on the beach while the sunrays hit our dewy skin—but every rose has its thorn, as the saying goes. Summer fashion can be sometimes a bit too revealing, putting all those parts we'd rather not display out in the open. But contrary to all reason and logic, there do exist ways to dress in summer outfits that are simultaneously slimming and in season. From universally flattering vertical stripes to sleeveless longline vests, we've got your back, girl. Keep scrolling to see 18 summer outfits that are always slimming, then shop similar pieces now! Partner a set of high-waisted jeans with a vertically striped button-down blouse tied at the waist. It's a perfect combo and flattering on every body type. A high-waisted skirt paired with a coordinating crop top tied at the waist elongates your torso and legs, for super-slimming impact. A boxy top might not seem like a universally flattering piece, but paired with a well-fitting miniskirt and cute strappy sandals, it's just right. Peplum tops are still around, and if you're looking to minimize your waist and accentuate your curves, they'll help you out. A midi-length sleeveless vest will elongate your lines and make you look your slimmest. If your casual summer look needs a bit of an edgy upgrade, just toss a moto vest over it. If you're ever in doubt this summer, just go for a black-and-white combo. The classic color duo is universally flattering, and the contrast ends up having a slimming effect. Traditionally, overalls are the most slimming wardrobe staples, but if you can find a pair that cinches in at the waist and flares out at the bottom, your life will change. A more voluminous skirt is best worn at the waist and paired with a classic, well-fitted cotton tank top. Two words: vertical stripes. They always look good, and they always flatter. Unexpected shapes, like bell sleeves, end up having a slimming effect because they emphasize the narrowest parts of your body. 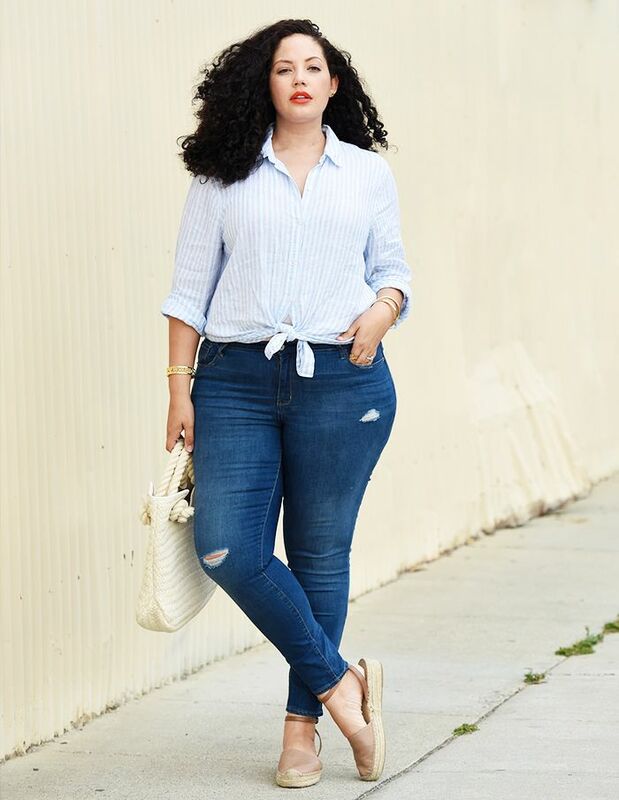 Every woman needs this uniform in her closet: a classic striped button-down blouse, high-waisted jeans, and black pumps. Adding layers does not necessarily mean adding bulk. Keep the fabrics light and mix up the lengths, and you're well on your way to your most slimming look yet. A sweet and easy wardrobe choice, a sundress with frilly details attracts the eye to the smallest part of your body—your waist. If you want to minimize your shoulders, go for a color-block dress like this one, which highlights your favorite parts while concealing the others. A flowing skirt with a fitted waist always flatters, especially when you pair it with a good set of heels. Throw on a boyfriend blazer with your favorite boyfriend jeans for a look that's simultaneously crisp and too-cool-to-care. Keep scrolling to shop flattering pieces inspired by these slimming summer outfits! What outfits do YOU think are most flattering for summer? Tell us below!